With expertly trained staff and Top Quality Casino Grade Equipment, we are second to none in the industry. Come in to our location for a free consultation and see the quality that we deliver. With over 15 years of experience in the Entertainment Industry, we are able to answer all questions regarding your event. Having worked alongside some of the biggest names in gaming, we pride ourselves on having the finest quality equipment and a level of professionalism like no other. Down To The Felt can accommodate your needs for any gaming event, from the most intimate of affairs to large-scale corporate productions. Plus, our seasoned event coordinators will gladly walk you through the whole process, assuring your plans will go as smoothly as possible on that special night. Down to the Felt is the premier casino and gaming rental company in the Tri-State area. 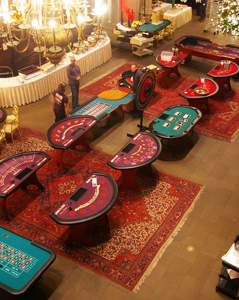 Treat your guests to something special, don't gamble on your entertainment choose... Down To The Felt. Copyright 2011. Down to the Felt Inc. All Rights Reserved.